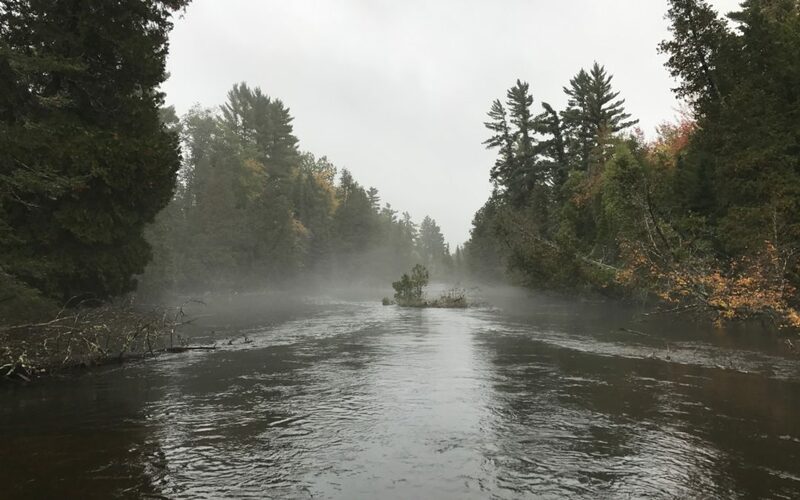 Finally some big rains, the kind that flush the system, that move the trout, that give the air the smell of wet leaves, cedar, the first woodsmoke of the season. 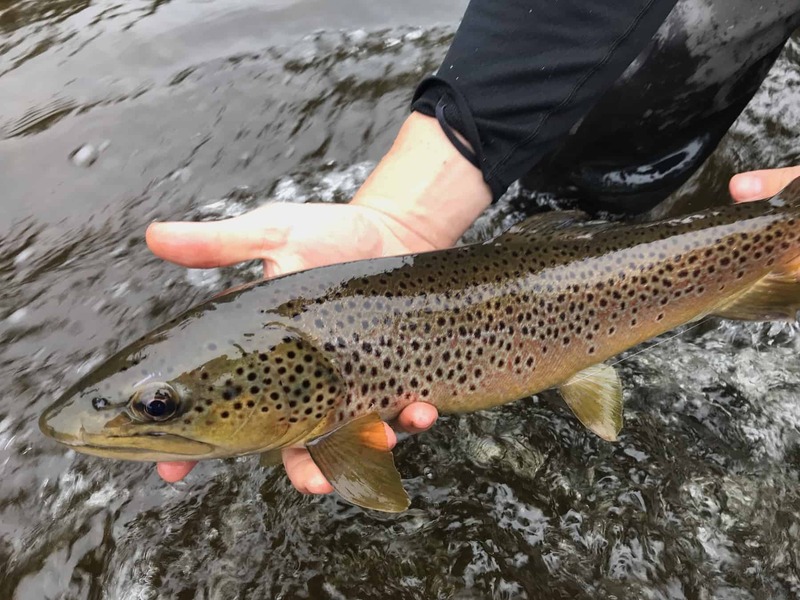 Finally a bit — just a taste — of some fall streamer fishing. There are some Octobers, like last year, that are too warm. November arrives too quickly, and we feel cheated. But 2018 is not one of those years. It sure has been fun to strip some flies the last few days. 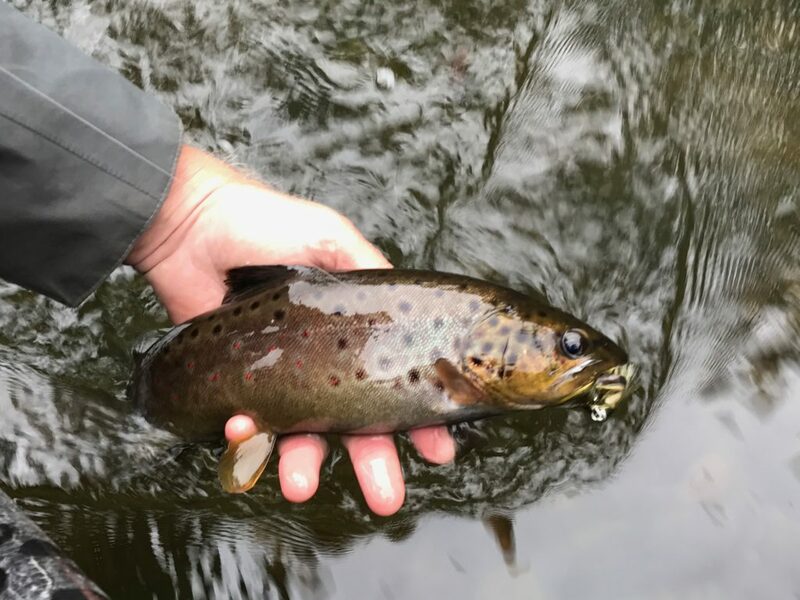 A nice brown from the upper river. Strange not to have a single red spot. Conditions are changing rapidly. This morning we had well over an inch of rain. The South Branch is flowing at just shy of 200 cubic feet per second (cfs…up from around 120) and seems to have leveled off, though this flow is at the whim of both tonight’s forecasted storms as well as the dam manager of Lake St. Helen. The North and Main both are on the rise, as is the river down at Parmalee, but there is nothing “flood” about it. Again, so much depends on how much rain we receive tonight. There is more rain expected Friday night. The trout are in pre-spawn mode. The water temperatures are in the low 50s. These are good things. Fish medium sized streamers on floating, intermediate, or lightly sinking line, and keep the fly moving. I’ve found that color means as much as anything. Over the last few days, olive, olive and white, cream, and yellow have all been productive. 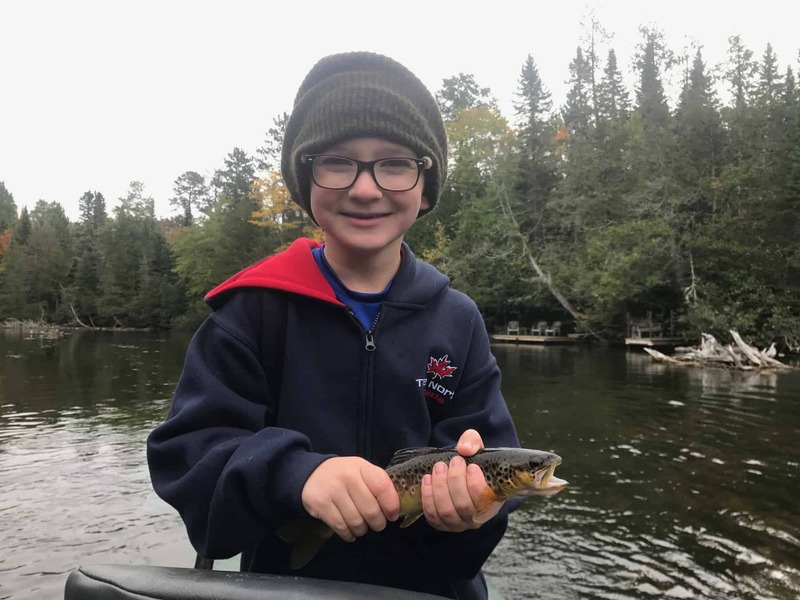 Holden and I did a short dry fly float the other day and there were pods of trout eating olives. It was great fishing. We didn’t blind fish much, just scooted between risers. He’s too young to wade right across the river so the boat is the best method. There were nice fish rising, even though most of them wanted the size 24 instead of the 20. They weren’t picky, but they wouldn’t touch a fly on 6x. It was 7x, and a long length of it at that. Every afternoon since, same thing. Yesterday evening there was a meaningful spinnerfall of size 20s. There are enough trout looking up to blind fish a dry fly, but I’d much rather nymph fish this time of year and wait for the afternoon rise. For nymphs, try something larger in this dirty water, with a small pheasant tail or other mayfly imitation off the back. Or tightline it with the big fly on the bottom. The trout in the Holy Waters are sitting behind the big grass beds that the BWOs hatch from. This is fine technical fishing. 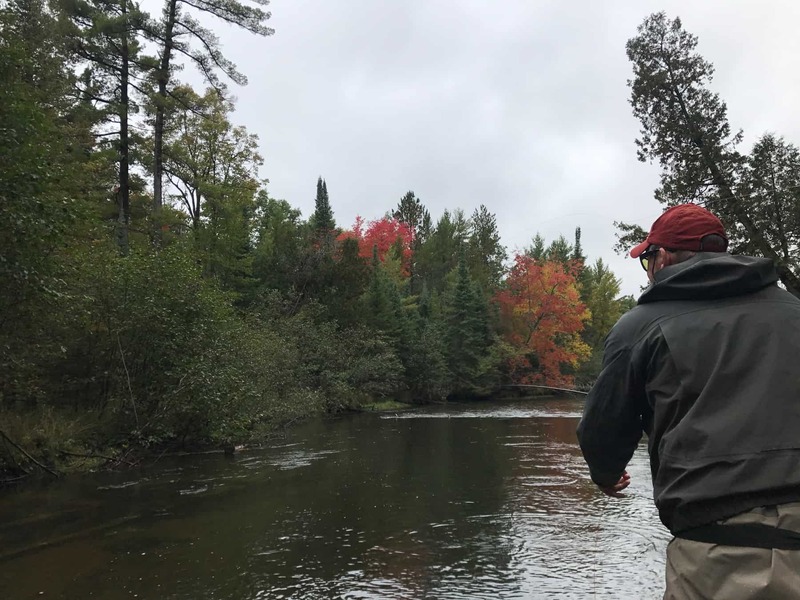 The real key to finding consistent rising trout in October is to find slow water. The trout will pod up and rise in such places on all three branches of the river. Fall reminds me of catching a wave, though I’m not a surfer. Actually, when I was a kid visiting Florida I was more of a boogie boarder or whatever you call the less cool things you lay on instead of stand on. What I remember was the magic of catching the first wave, because it’s the momentum of the ocean, finally, that you feel. In fall, there’s an earthly momentum that suddenly whisks us along, away from the summer, and toward something obscure or even unattainable. October is too short. It’s hard not to fish when the river is on the rise and the clouds are low and the trees are in flames. Hell, it’s impossible. There is nearly a month left in the Gates’ main season and we have some great weekday openings. October 27th is our last dinner, and October 28th is our last breakfast. There’s more to come this winter, after the New Year, so stay tuned. We’re also starting to prep our fall catalog for 2018. It’s gonna be a good one!